This is the second room on focus in my week-ish long series on small space living. Today, the focus is the kids' room. One of my favorite storage features in this room are these little woven storage cubes at the foot of Micah's bed. I love that they do triple duty as storage, playing surfaces (I mean, all superheroes need a cliff from which to rescue good citizens in peril, right?? ), and a nightstand for the all-essential bedtime beverages (milk and water). I bought these at Michael's several years ago for a very reasonable price. And, Michael's often puts their baskets on sale for 40% off - not bad for cute and affordable storage! This is another great storage piece. It was a Christmas gift from my in-laws a couple of years ago. I'm pretty sure it's from Target. I try to be very strict with the toys that go on this shelf - once we have too many to fit, we get rid of something. Sometimes books, sometimes toys, but I really have to be careful not to outgrow this shelf. And Micah still has plenty of things to read and play with, so it's never too tough of a decision. Inside the closet. I don't know how I would live without this shoe organizer. We use it for so much more than shoes - socks, belts, hats, gloves, capes. It's a pretty great piece. A more in-depth look into the closet. I think one of my favorite now essential elements is the basket on the bottom shelf. Yes, that one. When Micah grows out of an item of clothing, it goes in the basket. When the basket is full, the items go in a storage bin and are hauled up to the attic. Perfect. 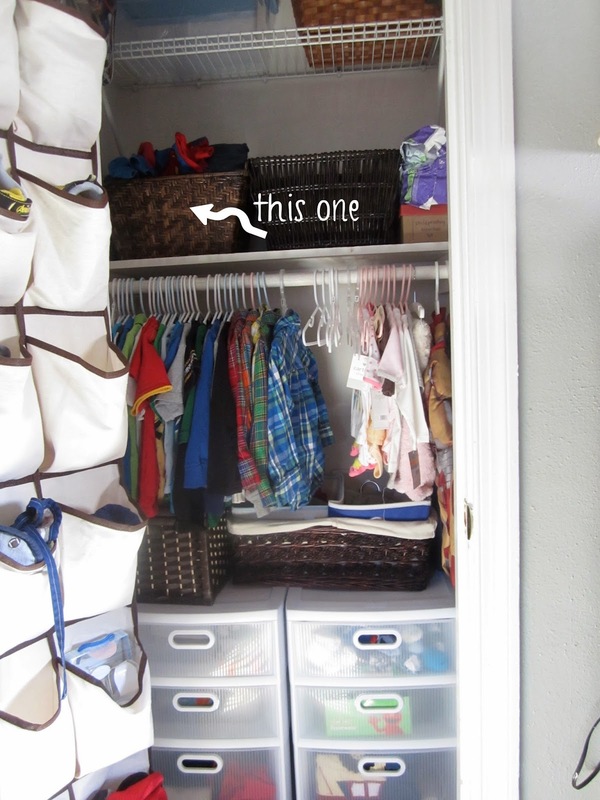 Having a place for those too-small clothes keeps my life easier and prevents ugly piles like I was building before the employment of the basket. I highly recommend it. I'd also like to note that I try and keep Micah's clothes limited as well. I don't want his shirts to take up the entire closet because very soon, he won't be the only one using the closet. So, just like the toys, when we have more than our space can handle, we share with friends, or bring to the thrift store or consignment shop. Another noteworthy point ... yes, Evie's clothes still hang in the closet. And yes, I even bought things for her after she died. Somehow that makes her still feel like a very real part of our family. I like it that way. The room will definitely need some other touches once the new baby arrives. Plans for the near future: under crib storage, complete reorganization of that second "dresser" in the closet, maybe some thinning out of toys and books to make room for baby toys, finding a new home for the stuffed animals in the crib. But I think it's possible and I'm not intimidated, mostly excited. *by all the time I mean approximately 0.03% of the time. Do you have a small space for you kids? How do you keep a handle on toys/clothes? What are your favorite storage pieces? Love it. My boys room is...well, lets just say it's "embarrassing post worthy". I went up there today, because they couldn't find any socks. I about died. Haha. Apparently, I MUST go up there every day, if not every hour. Only a few days ago it was perfect! What is it with boys and socks?! When he takes them off he literally throws them in two different directions! oh, and I second the use of the "clothes basket" for things to give away/put away. I think I need to get a shoe caddy thing! Looks useful!! I SO need to get on organizing Liam's room. Asher's room is a glorified guest room, as we plan to migrate him into Liam's room soon. Love the idea of the basket for clothes they grow out of. I'm constantly telling myself that I'll just move them out later, and then I run into the small clothes again and again!